The ASTP was a culmination of thirteen years of talks between the Soviet Union and the United States. 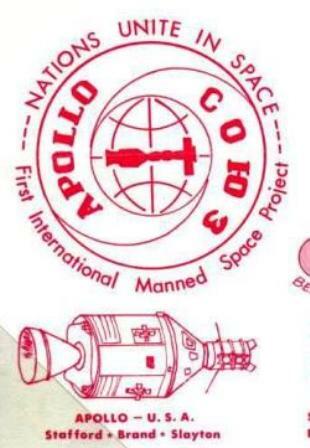 ASTP was formally provided for in the agreement concerning Cooperation in Exploration and Use of Outer Space signed by President Richard M. Nixon and Soviet Premier Alexi Kosygin in Moscow on May 24, 1972. Although used unofficially after the May Summit, ASTP did not become the official designation for the joint flight until June 30, 1972. Many milestones needed to be accomplished such as crew selection, language training, docking module and launch vehicle testing, tracking and timeline simulations to name a few before launch. This exhibit will show crew selection and training; prelaunch tests; launch, rendezvous and docking, recovery and finally the commemoration by many nations of the first joint space venture ever attempted. Frame 1: Title and exhibit plan, prelaunch testing. Frame 2: Launch, docking, and splashdown.